OAKLAND, Calif. — Some early offence and strong pitching provided just the recipe the Arizona Diamondbacks needed to snap out of their recent funk. 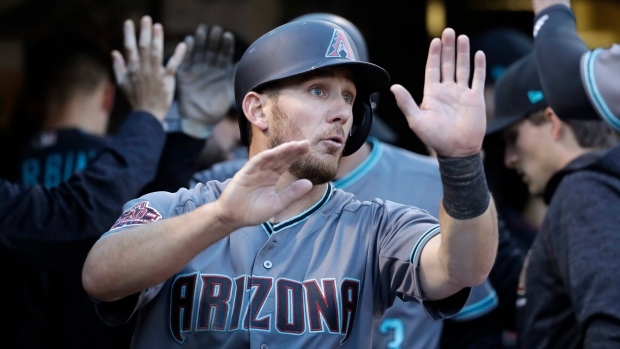 Patrick Corbin allowed four hits in seven innings and Nick Ahmed homered to help the Diamondbacks stop a seven-game losing streak with a 7-1 victory over the Oakland Athletics on Friday night. "It had been a while," first baseman Paul Goldschmidt said. "It had been a rough couple of week for us. It was good to come out and get that early lead there and to be able to tack on a few. Coburn pitched great. It's a good win." Goldschmidt and John Ryan Murphy drove in two runs apiece for the slumping Diamondbacks, who lost 13 of their previous 14 games and averaged 1.9 runs during that stretch. Corbin (5-1) was the beneficiary of some much-needed offence and ended a streak of five starts without a victory. He had pitched well in most of those games but hadn't gotten enough help from his lineup to win. The left-hander struck out seven, walked one and earned his 50th career win. "I think sometimes they put too much pressure on themselves the way things have been going," Coburn said of the Diamondbacks hitters. "It was just good to see. To see that long a stretch is not very common for this team." Mark Canha homered for Oakland but Sean Manaea (5-5) struggled for a fifth consecutive start, sending the A's to their sixth loss in seven home games. Manaea fell into a 1-0 hole just two batters into the game when Ahmed hit his seventh homer of the season, topping his total from a year ago. A leadoff walk to No. 9 hitter Jeff Mathis sparked a rally in the third by Arizona, with Murphy hitting a two-run double to make it 3-0. Ahmed then added an RBI single in the fourth before Goldschmidt's two-run triple on a sinking liner that got by a diving Chad Pinder in left field made it 6-1 and ended Manaea's night. "We had baserunners on all throughout the game," Arizona manager Torey Lovullo said. "We didn't let up. We had some quality at-bats, some team at-bats where guys were getting on base and guys were driving in runs." Manaea allowed six runs and eight hits in 3 2/3 innings, his fifth start in a row with at least four runs allowed. Manaea gave up just five runs total in his first six starts, winning the award as the AL's top pitcher in April. "I'm just falling behind guys and not really trusting my stuff right now," Manaea said. "It's baseball. I just have to figure things out. I have to figure things out and get my priorities in order." Diamondbacks: RHP Shelby Miller (elbow) threw a bullpen and is set for his first rehab start next week at Class A Visalia. He is expected to throw up to 75 pitches in that start. Lovullo said Miller will need at least two starts in the minors before being ready to return. ... OF Steven Souza Jr., who went on the DL this week with a strained right pectoral muscle, has not yet been cleared for baseball activity. Athletics: RHP Santiago Casilla left with a shoulder strain in the eighth inning and will likely go on the DL, manager Bob Melvin said. Canha's homer ended a streak of seven straight home games without a long ball for the A's, tying an Oakland record. The A's entered the day with the fewest homers at home with 14 in 23 games and the most on the road with 47 in 27 contests. Clay Buchholz (0-0) makes his second start for the Diamondbacks in the middle game of the series against Daniel Mengden (4-4).